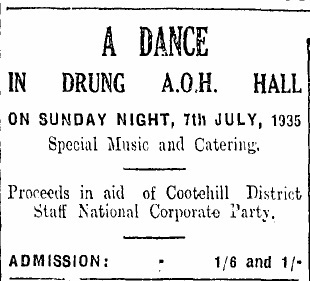 A number of ads for events to do with Eoin O’Duffys National Corporate Party. The National Corporate Party split from Fine Gael when Eoin O’Duffy ‘resigned’ as leader of Fine Gael and also the party. They were very right wing, virulently anti communist and had a military wing ‘The Greenshirts’. It lasted from 1935 to 1937 . As far as I’m aware they never contested an election.